You can purchase and associate Azure Active Directory (Azure AD) Premium editions with your Azure subscription. If you need to create a new Azure subscription, you'll also need to activate your licensing plan and Azure AD service access. Azure AD Premium and Basic editions are available for customers in China using the worldwide instance of Azure Active Directory. Azure AD Premium and Basic editions aren't currently supported in the Azure service operated by 21Vianet in China. For more information, talk to us using the Azure Active Directory Forum. Signing up using your Azure subscription with previously purchased and activated Azure AD licenses, automatically activates the licenses in the same directory. If that's not the case, you must still activate your license plan and your Azure AD access. For more information about activating your license plan, see Activate your new license plan. 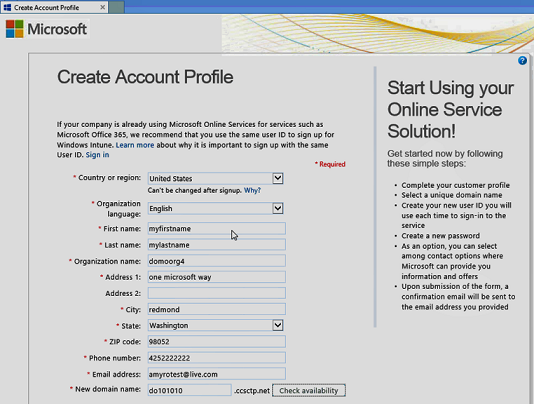 For more information about activating your Azure AD access, see Activate your Azure AD access. As an Azure or Office 365 subscriber, you can purchase the Azure Active Directory Premium editions online. For detailed steps, see How to Purchase Azure Active Directory Premium - Existing Customers or How to Purchase Azure Active Directory Premium - New Customers. For more information about EMS, see Enterprise Mobility + Security web site. For more information about volume licensing purchase options, see How to purchase through Volume Licensing. If you signed up using a new Azure AD license plan, you must activate it for your organization, using the confirmation email sent after purchase. 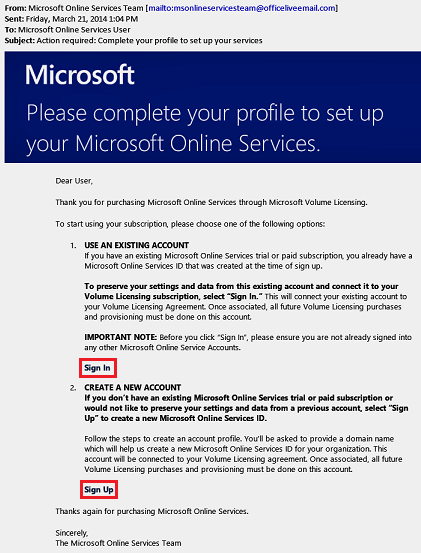 Open the confirmation email you received from Microsoft after you signed up, and then click either Sign In or Sign Up. Sign in. Choose this link if you have an existing tenant, and then sign in using your existing administrator account. You must be a global administrator on the tenant where the licenses are being activated. Sign up. Choose this link if you want to open the Create Account Profile page and create a new Azure AD tenant for your licensing plan. When you're done, you will see a confirmation box thanking you for activating the license plan for your tenant. If you're adding new Azure AD Premium licenses to an existing subscription, your Azure AD access should already be activated. 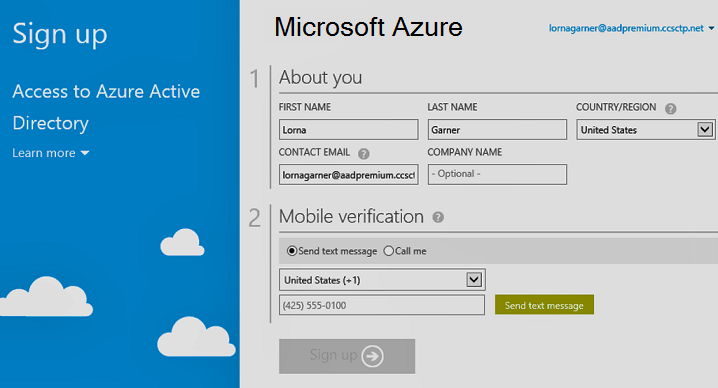 Otherwise, you need to activate Azure AD access after you receive the Welcome email. After your purchased licenses are provisioned in your directory, you'll receive a Welcome email. This email confirms that you can start managing your Azure AD Premium or Enterprise Mobility + Security licenses and features. 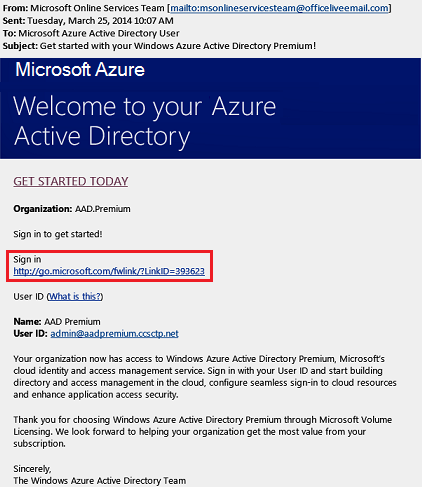 You won't be able to access Azure AD for your new tenant until you activate Azure AD directory access from the welcome email. Open the Welcome email, and then click Sign In. After successfully signing in, you'll go through two-step verification using a mobile device. The activation process typically takes only a few minutes and then you can use your Azure AD tenant. Now that you have Azure AD Premium, you can customize your domain, add your corporate branding, create a tenant, and add groups and users.